So…I’ve kind off been putting of blogging for the past few weeks, as I’m sure you can tell :P. The opera I’ve been playing for has taken up a surprising amount of creative energy, so although I’ve still been sewing a lot, I just really haven’t felt like writing about it. Do you ever get so wrapped up in one creative endeavor that you just don’t have room in your brain for anything else? Oof. While I know this is primarily a sewing blog, it just seemed strange to keep talking about my projects and not mention a little more about this huge endeavor that has been such a major part of my life for the past few months. So, long story short – I’ve been playing for the San Francisco Opera dancers to help prepare them for possibly the biggest opera production SFO has ever done – Berlioz’s Les Troyens (I.e. The Trojans). It has been a truly transformative experience working on a show of such magnitude and with such a stellar cast. Getting the opportunity to watch the famous mezzo-soprano Susan Graham rehearse the role of Dido pretty much blew my mind (I didn’t play for her rehearsals, but I did get to watch a few!). The whole process has been deeply humbling and inspiring, and has really lit a fire under me to keep improving my accompanying skills! Ok, now back to sewing. 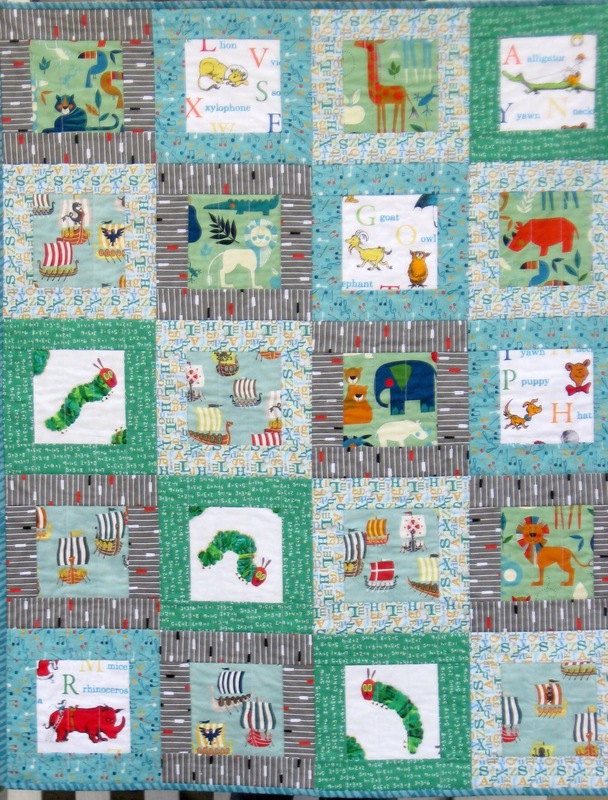 So, speaking of big and exciting things, one of my very good friends from college is expecting her first baby in July, so of course you know what that meant – baby quilt time! I wanted to make something simple, since I haven’t quilted in about a decade (seriously – my quilting phase was in high school! ), so I decided to let the fabric do most of the work. I made super simple blocks consisting of a fussy-cut center with a border, and then just did vertical straight lines for the quilting. It didn’t take me nearly as long as I thought it would to finish – a little over a week to piece, and about a week to quilt and bind. 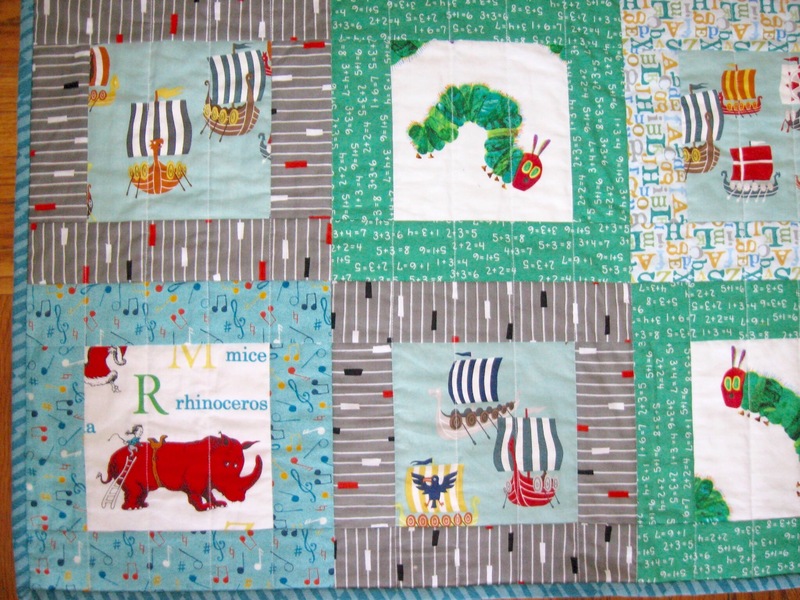 The quilt is for a baby boy, so I tried to keep the colors vaguely gender-appropriate without being too obvious. The backing fabric is even tiny snails! I got all of the fabrics at Stone Mountain and Daughter in Berkeley. 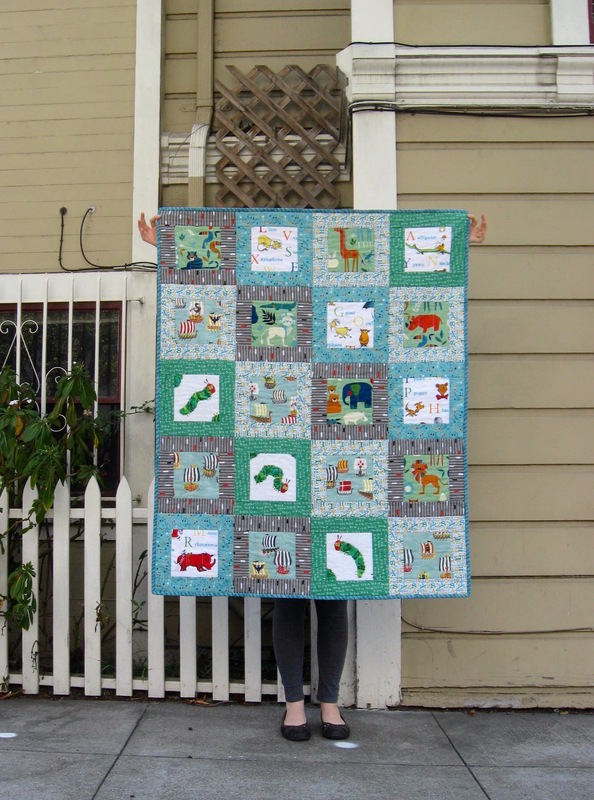 They have an amazing array of quilting fabrics – picking them out was almost as fun as sewing! 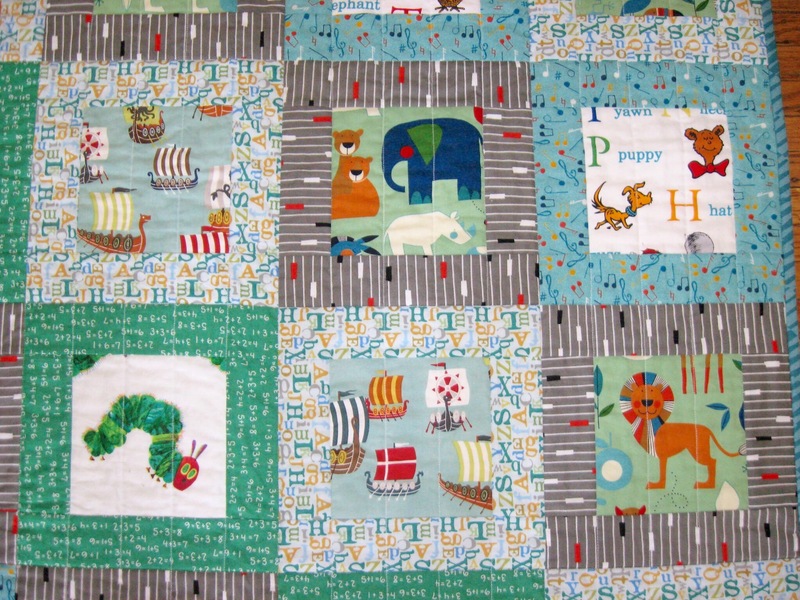 I especially love the Dr. Seuss and Very Hungry Caterpillar blocks :). 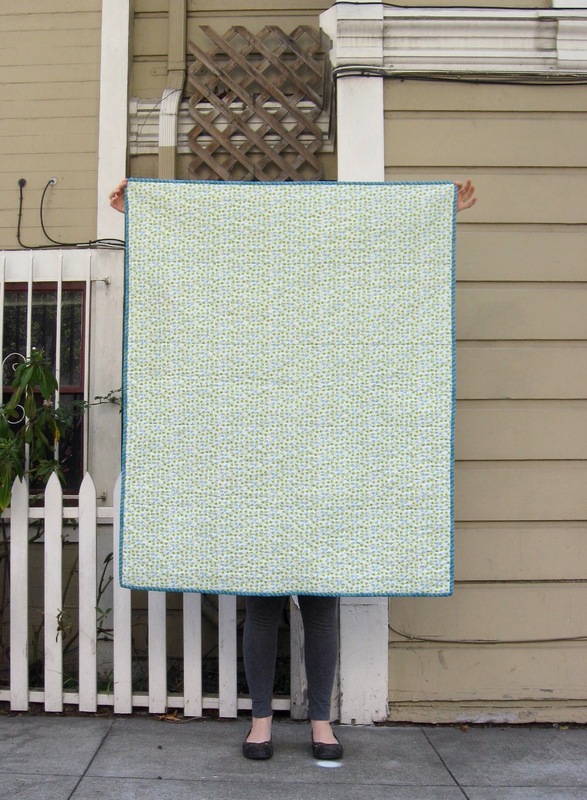 All in all, I’m so proud of this quilt, and so glad I got it done in time for the baby shower! !